WE CAN SALE ONE ARCH OR PAIR. Extends 50 mm more than standard arch. Fit to the side of the body. Colour black matt, can be painted. It could be fixed without drilling with glass adhesive! Collection available in Nottingham. Hecho de plástico casi indestructible ideal para extrema fuera de carretera. Acerca de nosotros. Enlaces de interés. Enlaces Sociales. B70 7TW, REINO UNIDO. KELVIN MANERA WEST BROMWICH, MIDLANDS DEL OESTE. The Land Rover Part number is LR010634. The Discovery 3 and Discovery 4 wheel arches are different - the key difference is the front end of this arch on the Discovery 3 slopes to a point - on the Discovery 4 there is a cap that fits onto the front end of the arch. WHEEL ARCH KIT / BODYKIT. Range Rover. Sport Wheel Arch Kit. Sport fibreglass 10 x piece wide wheel arch kit. Will fit 2004-2013 model Range Rover Sports. RANGE ROVER. SPORT UNIVERSAL. WE MUST STRESS THIS KIT IS NOT SUITABLE FOR A DIY PROJECT. The Discovery 3 and Discovery 4 wheel arches are different - the key difference is the front end of this arch on the Discovery 3 slopes to a point - on the Discovery 4 there is a cap that fits onto the front end of the arch. 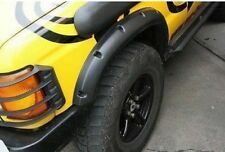 Land Rover Defender ABS Plastic Wide Wheel Arches. Not made from GRP like the cheaper versions available which crack very easily. Made from High Quality ABS Plastic. 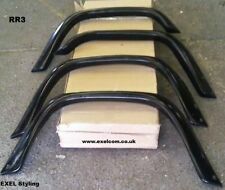 5 DOOR 2" Wide Wheel Arches. 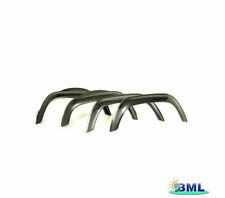 This kit is for 4 2" wider wheel arches complete with fittings. Land Rover Discovery 1 - 5 Door Models Only. Range Rover Classic - 5 Door Models Only. UK Mainland Orders. 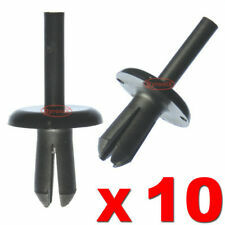 These are suitable for all Land Rover Defender models. Add to Favourites. There are 9 pieces ( on each side ) that make up the wheel arch / door trims on the Land Rover Discovery 4 ( 18 pieces in total - see pictures ). If you are upgrading a Discovery 3 to a Discovery 4 and have fitted the Discovery 4 front wings you will need to buy the following parts. Range RoverVogue L405 Wheel Arch Kit. Will fit 2013-Present L405 model Range Rover Vogue. RANGE ROVERVOGUE L405. WHEEL ARCH KIT / BODYKIT. Range Rover. 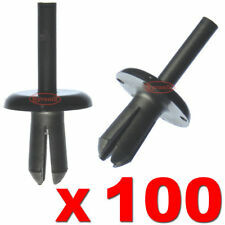 Range RoverVogue fibreglass 10 x piece wide wheel arch kit. This is just one of the plastic fixings used to hold the wheel arches on Defender 90 110 130 models. Range Rover Sport SVR models from 2014 onwards. Land Rover Part No:LR063747/LR063748/LR063749/LR063750. Wheel Arch Protector suitable for all 4 arches. WHEEL ARCHES PROTECTOR. Easily fits round edge of wheel arches. Subtle profile height of 18mm with an under arch 4mm turn in. Manufactured in flexible high impact ABS material. This could be used as an alternative to Land Rover LR010632. The Discovery 3 and Discovery 4 wheel arches are different - the key difference is the front end of this arch on the Discovery 3 slopes to a point - on the Discovery 4 there is a cap that fits onto the front end of the arch. 2X FRONT ARCHES. 2X FRONT OF REAR ARCHES. 2X REAR OF REAR ARCHES. FULL WHEEL ARCH MOULDING KIT. LAND ROVER DISCOVERY 2, (1998-2004). UK Mainland Orders. Recovery 4x4 are authorised distributors for Allmakes 4x4, Bearmach and Britpart Land Rover parts and accessories. Land Rover Defender 90 110 O/S/F Arco de Rueda. REMOVED FROM A LANDROVER DEFENDER. FOR SALE IS A USED WHEEL ARCH. Grundierte Original ROVER Verbreiterung hinten links, für alle Mini mit 13" SportPack Fahrwerk. Lieferung ohne Befestigungsmaterial. (ZUA000220LML). 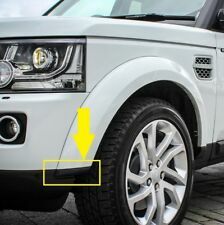 Range Rover Sport SVR Style Door Mouldings. SPORT SVR STYLE DOOR MOULDINGS. Sport SVR Style. 6 x piece lower door mouldings. Range Rover. Will fit 2013 model Range Rover Sports. RANGE ROVER. Accessories are parts made for comfort, convenience, performance or customization, and are designed for add-on after the original sale of the motor vehicle. 2011 -ON RANGE ROVER EVOQUE REAR N/S WHEEL ARCH TRIM. THIS ARCH TRIM IS A USED PART. THIS IS A GENUINE LAND ROVER PART. Headlights & Rear Lights. Rear Bumpers. Front Bumpers. Isle of Wight, Isle Of Man, Channel Islands, Northern Ireland, Isles of Scilly. The Land Rover Part number is LR010633. The Discovery 3 and Discovery 4 wheel arches are different - the key difference is the front end of this arch on the Discovery 3 slopes to a point - on the Discovery 4 there is a cap that fits onto the front end of the arch. 3 DOOR TERRAFIRMA EXTRA WIDE WHEEL ARCH KIT. LAND ROVER DISCOVERY 1 1989 - 1998. LAND ROVER RANGE ROVER CLASSIC. PARTS COLOUR MAY VERY DUE TO MANUFACTURE PRODUCTION. PICTURES AND PART NUMBERS ARE FOR REFERENCE ONLY AND DO NOT IMPLY THE MANUFACTURER. This is just one of the fixings used to hold on the wheel arches on Defender 90 110 130 models. Grundierte Original ROVER Verbreiterung hinten rechts, für alle Mini mit 13" SportPack Fahrwerk. Lieferung ohne Befestigungsmatrial. (ZUA000210LML). LAND ROVER 2Stk. Radlauf Verbreiterung Kotflügelverbreiterung 71cm. Die Radlauf-Verbreiterung veredelt das Fahrzeug mit einem dynamischen Abschluss – dezent und wirkungsvoll. Die Kotflügelverbreiterung hebt zum einen die dynamische Eleganz hervor und betont zum anderen zusätzlich und auf individuelle Weise die sportliche Optik des Autos. LAND ROVER DEFENDER 1983 – 2006 ALL. LAND ROVER DEFENDER 2007> ALL. STANDARD BLACK GLOSS WHEEL ARCH KIT. We are happy to help you. Parts colour may very due to manufacture production. PICTURES AND PART NUMBERS ARE FOR REFERENCE ONLY AND DO NOT IMPLY THE MANUFACTURER. For Sale is a Left Front Wheel Arch Trim, removed from a 2018 LR2725 LAND ROVER DISCOVERY SPORT 5 Door Estate. DISCOVERY SPORT 2014 -2019 Mk1 (L550). Car Colour Black. Examples of this would be Canary Islands are NOT mainland Spain. WHEEL ARCH KIT. LAND ROVER DISCOVERY 2. We are happy to help you. Parts colour may very due to manufacture production. PICTURES AND PART NUMBERS ARE FOR REFERENCE ONLY AND DO NOT IMPLY THE MANUFACTURER. Part Number - DFK100910. Here We Have a Genuine Land Rover Left Hand Rear Mini Wheel Arch Flare. 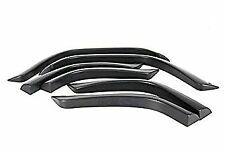 Set of (4)Land Rover Defender 90/110 2" (5cm) Wide Wheel Arches (New). Condition i s n e w. B rought them from flat dog for 144, if u can pick them up easily then can’t go wrong at 120£. H eight 5.608 ( cms;). Part Number - DFK100502LDA. Here We Have a Genuine Land Rover Right Hand Rear Large Wheel Arch Flare. Suitable For the 5 Door Freelander 1 Models. Part Number - DFK500190PMA. Here We Have a Genuine Land Rover Left Hand Rear Wheel Arch Flare. Land Rover Discovery 4. 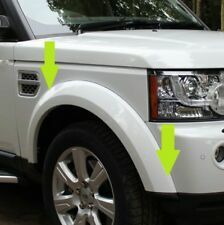 These wheel arches WILL FIT all Land Rover Discovery 4 models. These parts have a textured finish on all Discovery 4 models. This will fit all Discovery 4 models from 2010 to 2016 ( this includes the facelift models ). Part Number - CGE500470. Here We Have a Genuine Land Rover Left Hand Rear Door Wheelarch Seal. Suitable For the Range Rover Sport Models.